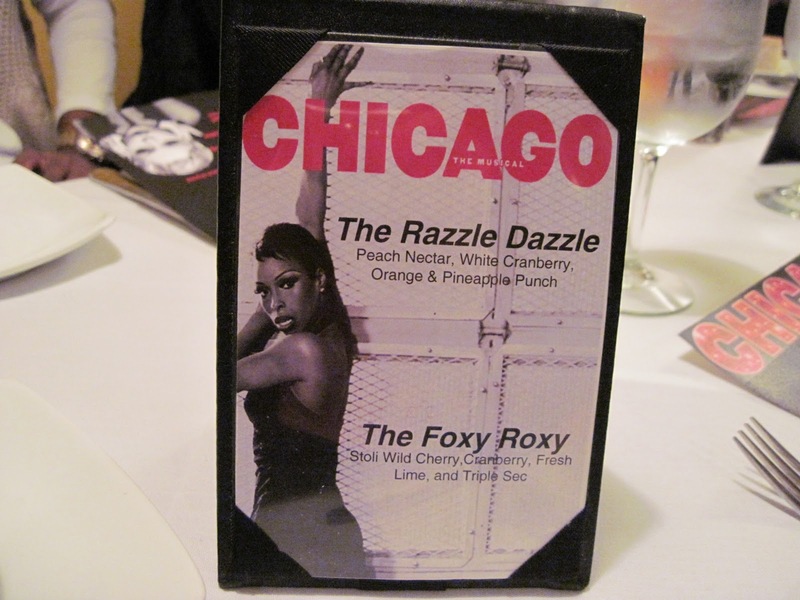 I was lucky enough to win a ‘Chicago Facebook Fan Day VIP’ Prize which included reserved seats at the show, lunch at B. Smith’s with 2 of the lead’s from the cast, a gift bag with a T-shirt and a bolero and a limo ride to the theater. Pretty incredible day overall. 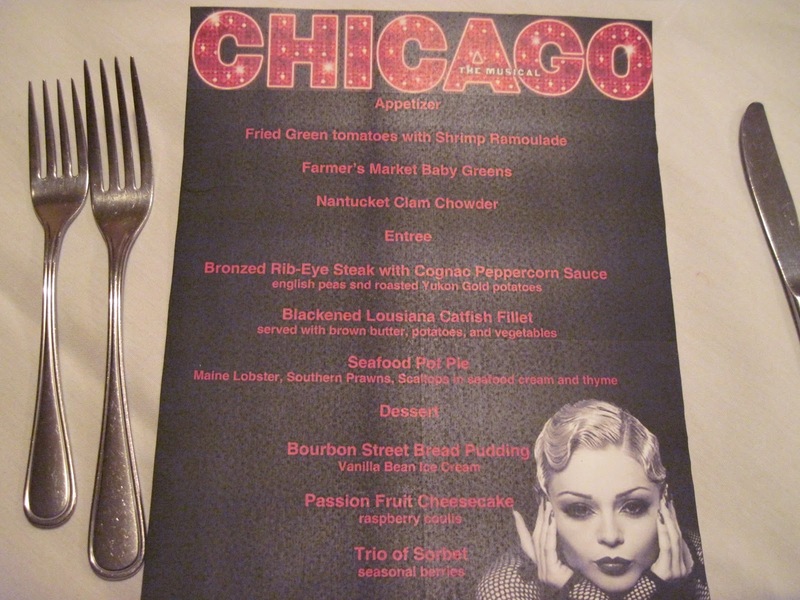 We were given a special 3 course menu as well as 2 fancy drink options, and it was a real treat to be treated like VIPs. I sat across from Colman, who plays Billy Flynn in the show and it was great to chat with him and find out that he is totally down to earth. The other people who were sitting at our end of the table were also a complete joy to hang out with, and I felt really lucky to be at such a cool event with really appreciative and enthusiastic people. I started with a simple green salad (not pictured) and the ‘Foxy Roxy’ a fruity drink that they came up with for us…I RARELY drink and wondered if indulging at noon on a Sunday was such a smart idea, but it turned out to be mostly juice. I couldn’t even taste the alcohol in it…which was fine by me. I asked the waiter what he recommended for an entree and he said the steak was excellent, so I went for it. I should not have believed him. It was overcooked, dry, and slobbered in a mustard sauce that completely took over the whole dish. 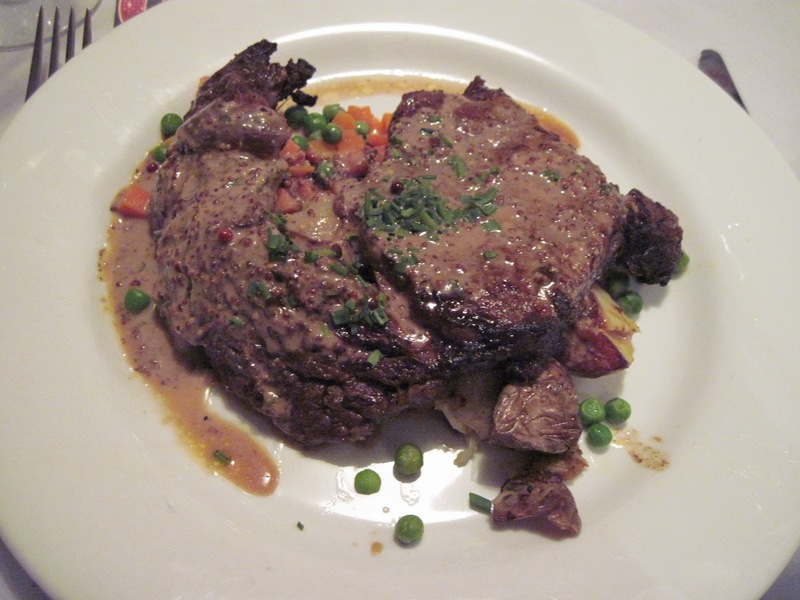 It sat atop a medley of peas, carrot and potatoes that was one baby step above airplane food. The dessert was a pleasant surprise. 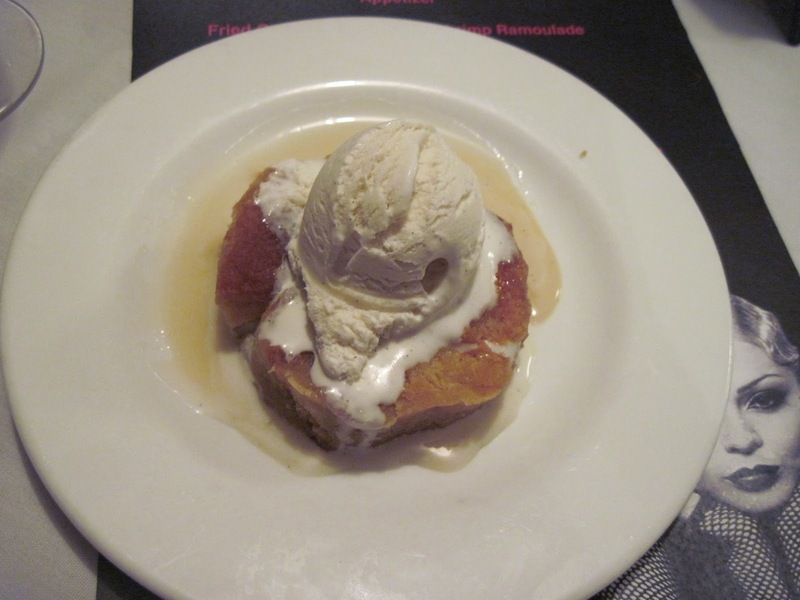 I am pretty easy to please when it comes to carbs and sugar, and the bread pudding was quite delicious actually. It came with a very vanilla-y ice cream on top and I cleaned the plate. If you’re in the area and looking for a great restaurant, try Orso instead. Now THAT is a fantastic place to eat. As far as B. Smith’s goes, I’ll give it a little pat on the back for the yummy dessert and efficient service, but just cause it was free for me, did not mean it was good.